Two-toned. Breathable, wind and waterproof. Taped seams. 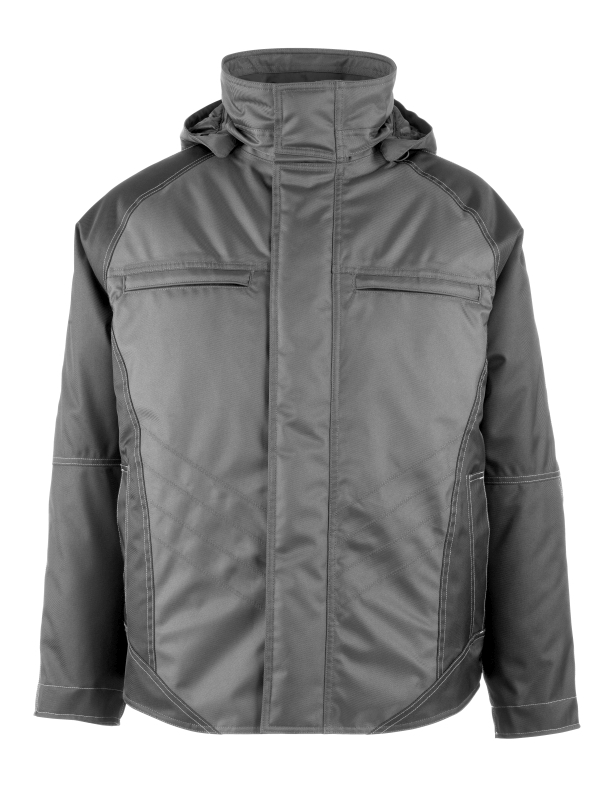 Detachable lined hood with adjustable drawstring. Lining of quilted fleece. Fastening with zip and storm flap with press studs. Zipped pocket under storm flap. Chest pockets with zip. Easy access to integrated phone pocket inside the breast pocket. D-ring. Front pockets. Inner pocket with zip. Rib (hidden in storm flap) at cuffs. Internal drawstring adjustment at the hip. Zip at lower back for logo printing/embroidery. Reflectors. Ergonomic fit with a slightly rounded bottom edge, which allows perfect freedom of movement. Sought-after design with lightweight fabric allowing the collar to move flexibly with head movements. Zip pocket under the storm flap, which can be accessed without opening the jacket. Chest (to fit) S - 36", M - 39", L - 41", XL - 44", 2XL - 46"